OK here is my next attempt at decorating a pumpkin! Just like my pentacle pumpkin this one is really easy too, you just need a permanent marker, preferably in black so that it stands out nicely. And of course a pumpkin! So, this is the Gratitude Pumpkin. I got the idea from the website http://www.oneartsymama.com Amy there has loads of wonderful ideas for things you can do with children, well worth a visit. 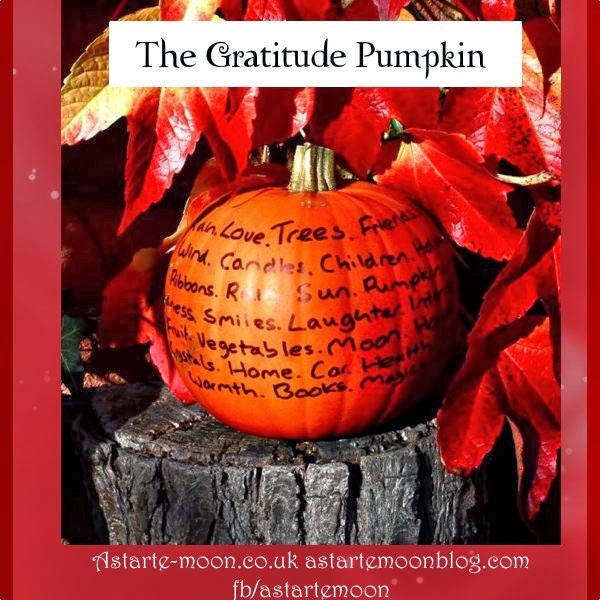 In making my gratitude pumpkin I first lit a candle, orange to honour Samhain; I then sat for a while meditating on all the I have in my life to be grateful for. I then proceeded to put write some of those things onto my Gratitude Pumpkin. I just wrote the words around the pumpkin, trying to follow the curve but it's not that easy to do, your attempts may come out more artistic than mine! 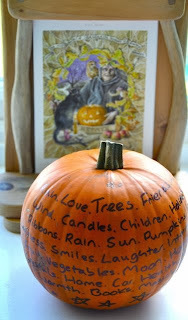 You could write the words randomly all over the pumpkin that would look fabulous too I think. This is an exercise that all the family can join in. Children could make their own with supervision or can join in with a Family Gratitude Pumpkin. Most of all, have fun and as you do it, really feel in your heart, the gratitude that you feel knowing you have all these things in your life. I do try and practice gratitude every day, thinking of three things to be grateful for before I fall asleep each night. Writing the words down like this really cements that gratitude in your mind, reminding you that however difficult life gets there is always so much to be grateful for. So enjoy getting creative and make your gratitude pumpkin today. I would love to see any examples of your work! What a wonderful way to celebrate Samhain...I love it!!! A brilliant idea! I love it. What a wonderful way to begin the year!